Over the past few months, the rapid spread of Zika has had devastating effects in many parts of the world. Unfortunately, there is currently no vaccine or cure. On March 31, researchers from Purdue University solved and published the atomic structure of the Zika virus. Using this data, we are now able to visualize the structural composition of the viral capsid shell that works to protect the Zika genome and infect host cells. The result of this data provides incredible insight on specific regions of the virus that could be used as potential targets for vaccines and therapeutics. Figure 1.The mature Zika capsid shell protects the viral genome and is comprised of proteins that help in host recognition and infiltration. Various representations, exploration tools, and data-driven color schemes help visually disseminate the data. Shown in the Autodesk Research Molecule Viewer. So, did the Bio/Nano group help defeat Zika? The answer is no, not really. But we want to help. Designers and engineers across many industries rely on Autodesk’s digital tools to help realize their creations in the built world around us. In life sciences, biological researchers, designers, and engineers work with molecular and nano structures at a scale completely unviewable to the human eye. In turn, we rely on visualization of experimental data to piece together glimpses of the molecular machines and processes that work in concert to keep our bodies running. And boy, are they incredible to see. 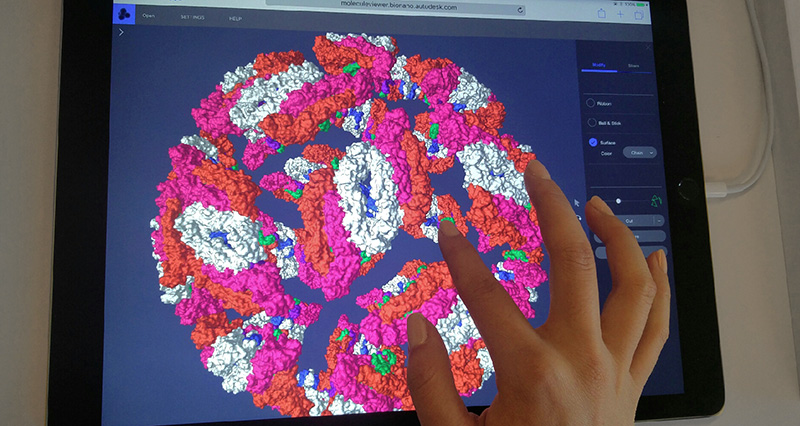 The Molecule Viewer project leverages Autodesk’s strength in 3D visualization to provide a window into this unseen world to support research, therapeutics, education, and beyond. The Viewer is web-based, cloud-enabled, and optimized for viewing, exploring, and sharing of large-scale protein datasets from the Protein Data Bank. It is built on top of Autodesk’s Large Model Viewer, the same technology that allows designers and engineers to explore complex designs at the human scale. Figure 2.The Zika virus is composed of 180 copies of this unit. It is part of a family of viruses called flaviviruses. Viruses in the same family have very common structural similarities. Tagged in this model is the main site of difference between Zika and others in the same family, including Dengue virus and West Nile virus. Visualized in the Autodesk Research Molecule Viewer. On March 31, we saw Molecule Viewer at the forefront of visualizing and communicating the novel, fresh-off-the-press Zika scientific data in a 3D environment shared to and between hundreds of viewers within just a few short hours, allowing both scientists and the public to explore and interact with complex scientific data in a web browser and on their touch devices. Take a look the Molecule Viewer project featured in a 'Today in the Lab' segment. To find out more, browse our pages on the Molecule Viewer and how Autodesk’s Bio/Nano Research group is bringing the power of design to new fields.